Little Live Pets is a new range of butterflies and birds from Character Toys, that come alive in your hand to become your pet friend. The more you feed and play with them, the more they interact. 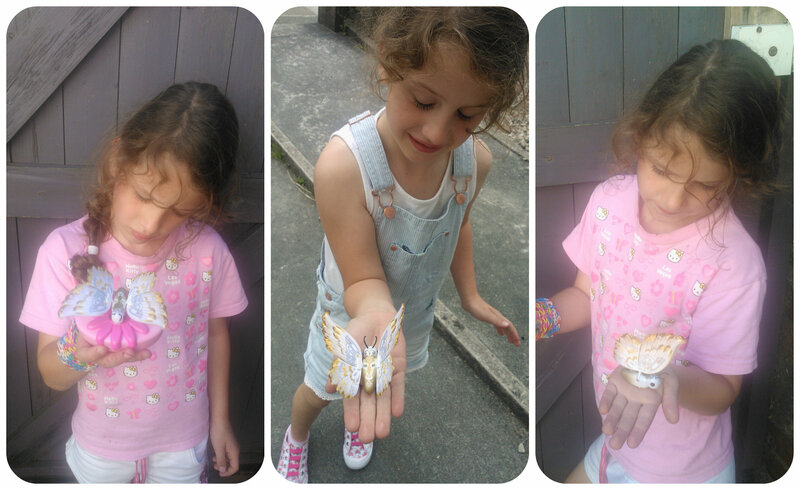 We received Angelic Wings, one of the six butterflies in the range to collect. Angelic Wings is a pretty gold and silver butterfly with a pink sparkly flower base. The base requires 2AA batteries and this is used to feed (charge) the butterfly. The butterfly is aimed at children aged 5+ due to being slightly delicate. It has thin wings that flutter at different speeds and length of time depending on how much it has been fed and played with. 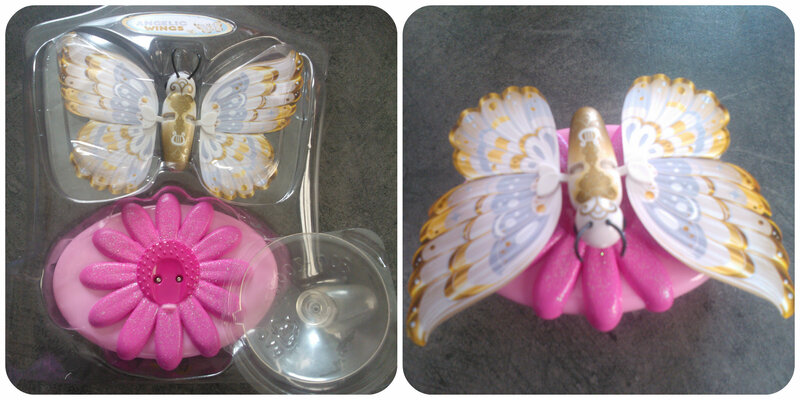 It also comes with a press on window holder so that you can display your butterfly on your window if you wish. You can let the butterfly just rest in your hand and it will flutter away showing you how happy it is, the happier it is the smoother and longer it will flutter for. If it is not very happy then it only flutters for a short time with fast rapid movements. Miss M was intrigued by the butterfly and liked the idea that the more she played with it, the happier it became but was also a little disappointed that all it did was flutter it’s wings. I think she had seen the bird, also from the Little Live Pets range which sings to you and you can record a tune with and had expected something similar with the butterfly. For £12.99 you get what you pay for although I would have been happier to pay a little more to get some additional features with this. The children do let the butterfly flutter in their hands each day for a few minutes but there’s not enough to keep them interested long term. For a child that loves butterflies then they may love this and with six different coloured butterflies in the collection, there is something to suit all tastes. All reviews are my own and my family’s opinions and the butterfly was sent to us in order to write the review. 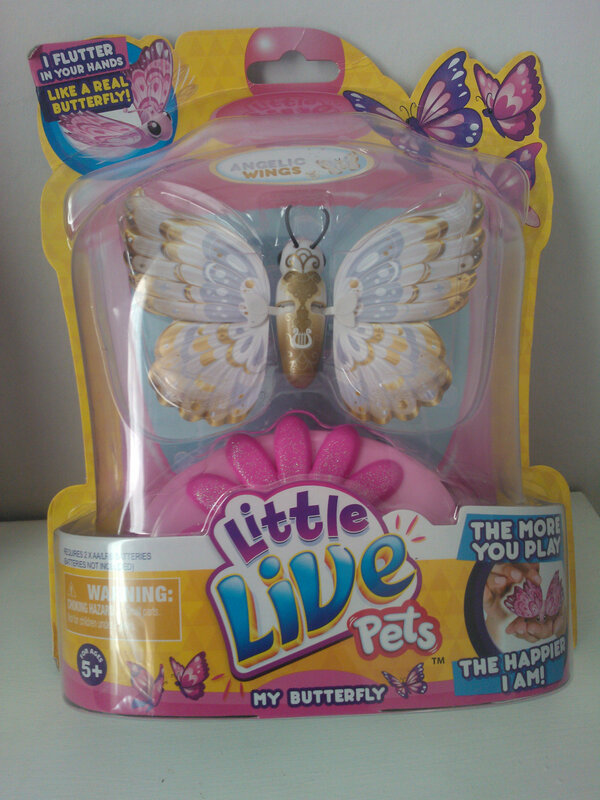 This entry was posted in Reviews and tagged 5+, butterfly, character, kids, little live pets, toys by Fiona Martin. Bookmark the permalink. I think this will be great for display or to tease younger children with the flutter wings. We had the bird and it get more interact as it talk to us. I can totally understand why the butterfly have limit use as they dun talk. Shamed thou. I love how it flutters! My two are not big fans of butterflies so wouldn’t be that bothered but I know a little girl who would love it! Kel recently posted…#Alphabetphoto K is for………. Yes I can see the bird holding a child’s interest for longer but I guess that’s also the limitation with picking a butterfly to theme this on. This looks cute but I don’t think my two would be interested for long. It’s very pretty though. 7yo would love this for the novelty factor. Wow! It’s mad, I can’t believe it’s little wings, it really does look very impressive. I do agree that the bird must be better, so that must be completely amazing!